Tons of marketers hate data, so they only focus on the low-hanging fruit. These “vanity metrics” include data like total page views, Twitter followers, and other fluffy numbers. The strongest marketers are the ones who collect actionable data. Doing so leads to the most profitable outcomes. If you’d like to be more actionable with your analytics, start with the “so what?” question. For example, clickthroughs and blog views are nice to have, but do they impact revenue? When you frame your decisions through the “so what?” question, you’re beginning to dig deeper into analytics. Here are five ways to make the most out of your marketing analytics. 1. Stop relying on gut instincts. A whopping forty percent of marketers say that they use intuition to make decisions. Way too many businesses are just gambling on their marketing plans. Bad guesses waste your time and resources. Since these marketers probably don’t measure the outcomes of their decisions, they are also likely to repeat past mistakes. In contrast, actionable data can help to drive better decisions. Strategic use of Google Analytics lets you put numbers behind your marketing campaigns, so you can make decisions from data that is measurable and actionable. 2. Don’t be a lukewarm user. Nearly half of all marketers believe that their most underutilized asset is their data. Sure, you are busy. You also have to set up tracking tools in Google Analytics ahead of time, which requires advance planning. That’s why it’s just easier to rely on vanity metrics. Do your homework. There are tons of resources to walk you through the basics of UTM parameters, conversion goals, and traffic channels. Although it takes more effort to set up individual campaign tracking in Google Analytics, it’s worth it when your actionable data starts pouring in. 3. Focus on what your customers are actually doing. Using Google Analytics to better understand your customer behavior can pay off in a big way. Easily track customer paths and run behavior reports to figure out what people are doing on your website. Evaluate drop-off points to determine where customers might be getting confused or frustrated. Experiments, or A/B tests, can also be run through Google Analytics. A/B testing is critical to becoming a data-minded marketer. A surprisingly low 24 percent of marketers create and test hypotheses. Marketers are missing the opportunity to collect real data and improve customers’ experiences. 4. Be consistent with analysis. When marketing departments are busy, complex analysis can become a lower priority. That’s probably why only 37 percent of marketers use analytics on a regular basis. Vanity metrics are so much easier to collect and understand. Analyze your past data to make smart predictions about future campaigns. Even though analysis is time-consuming, making the effort is valuable. Using analytics to improve marketing campaigns can save time—and increase revenue—in the long run. #5. Assign real dollar values. 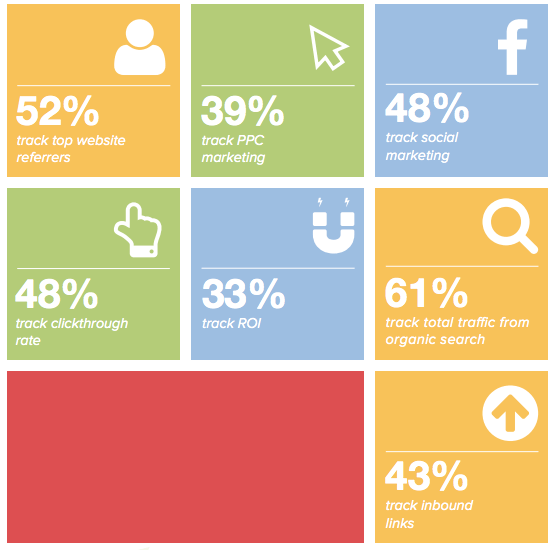 Can you believe that only one-third of marketers track ROI on their campaigns? That might just be the most important number you can track! Dollars and revenue probably need more of your focus. Don’t spend all your time on numbers that won’t lead to much. Leverage analytics tools such as Google Analytics to help you calculate the actual value of your marketing efforts. When you calculate values for customer actions, you can calculate ROI. This makes it much easier to prove the success of your marketing campaigns. Moving past the vanity metrics means that you’ll rely less on intuition and more on hard data. Leveraging tools like Google Analytics takes an investment of time, but your effort can result in saved time, better predictions, and stronger return on investment. When you are collecting actionable data, you can make better marketing decisions.